Replacing a toilet brush isn’t hard at all. You can simply go to any store and buy one, but why not get one that is of a better quality? You don’t want some ugly toilet brush and holder that looks like it’s going to fall apart in your bathroom do you? Let me play psychic for a moment. I see your bathroom toilet brush. It’s coming to me now. Its white right? And made of cheap plastic. Gee, how did I guess? Because we all go for the basic toilet brush and holder set instead of really taking the time to find something nice. When you buy one of these cheap toilet brushes at a local store, is it really the right toilet brush to use? I mean you don’t want a toilet brush set that looks like a birthday candle when you are done with it. Seeing its handle and bristles isn’t too appealing. You can do better. What do you want in a new toilet brush holder? First off we don’t want to see the wet bristles hanging out. Enough said on that, right? You would prefer that you didn’t see them. You will want the bristles to be able to dry before using again. If they stay wet, it can get pretty gross. There should be a place in the holder that allows the brush to dry and lets the water drip down into a separate compartment. With today’s new technology with metals and plastics, you can find toilet brush holders in a wide array of colors and styles. There is no reason to resign yourself to that old plain white one. So what types of toilet brush holders are available besides cheap white plastic? I’m glad ya asked. Want to add a certain richness to your bathroom? 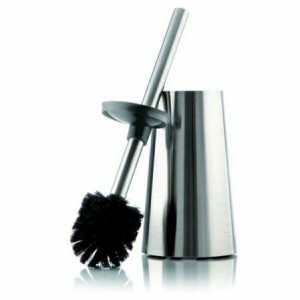 Then check out a stainless steel toilet brush and holder set. I personally think that looks a lot better than the plastic ones. As you can see, you are no longer limited in the style of toilet brush to get. Shop around online to find the best matching toilet brush holder for your bathroom today.